Kate Walker (standing, centre) and James Wilkinson (seated beside her) argued for radical change in many areas of life. Both were strong supporters of dress reform for women, and when the pair married in 1894, Kate and her bridesmaids all wore knickerbocker costumes. 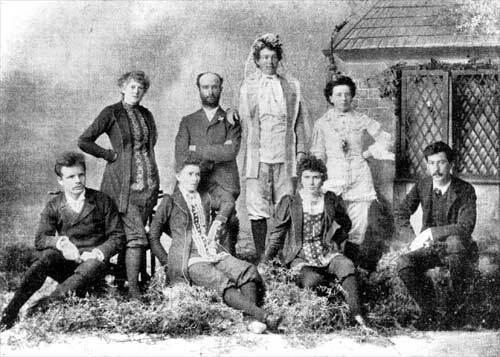 The wedding party includes several of those involved in the New Zealand Dress Reform Association. Kate and James Wilkinson were founding members, and were joint authors of a 35-page pamphlet on dress reform. Among the bridesmaids are Alice Burn, first president of the Rational Dress Association, and Miss Meredith, the treasurer. The photograph was published in the New Zealand Graphic and Ladies' Journal.